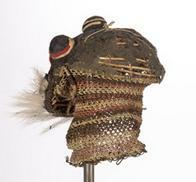 Cornell: Selections from the Anthropology Collections; Mask, probably the ikishi Chizaluki or a variant. The mask is made of bark cloth which is coated with pounded resin, tied over a basketry frame with bark string. The neck is of crocheted bark string. The colors used are red, black, white, and brown (5 YR 3/1-4/1 dark gray); the neck decoration consists of rows of beige, brown, and red (10 R 6/6-5/6 red) bark string. The face is decorated with black and red cloth, red felt, and paper. The eyes are slits in the red felt, the nose is slightly raised, and the mouth is of paper. The brow is raised and decorated with 3 bulb-shaped pieces of bark cloth each decorated with 3 concentric lines--one of paper, the next of red felt, and the last of paper. There is a beard attached to the chin signifying chiefly authority, made of fur (possibly sable antelope). On either side of the forehead, there are earring pieces striped in white, brown, white, and beige pattern. Chizaluki is one of over 50 masked makishi (ancestral spirits embodied by men in masks and costumes; singular ikishi) presented by dancers in the Kwidisha part of the Mukanda ceremonies (circumcision rites).